Hey! 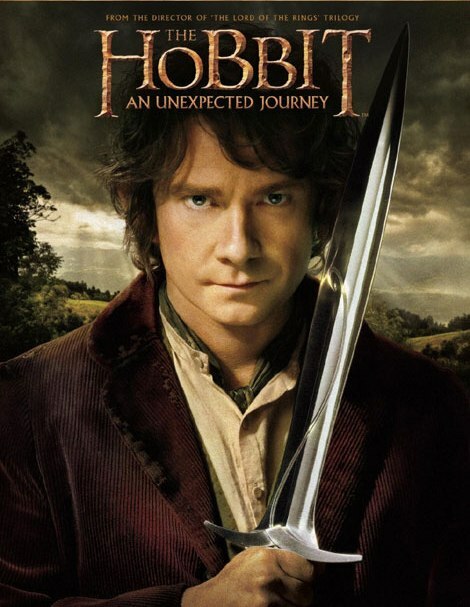 I know how much you like music, so when I saw The Hobbit: An Unexpected Journey, I knew I just had to write you about it. Why? Because there are three songs in it that I think you would really enjoy. 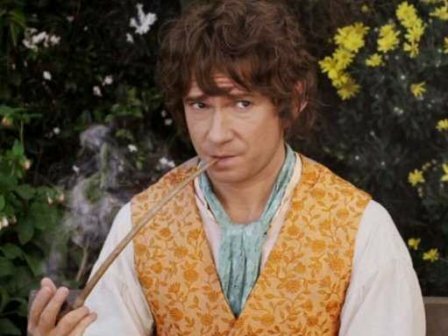 And several other bad things they say they should do to poor Bilbo’s china. But, of course, they don’t actually follow up on these words. Instead they clean up the dishes without breaking anything. If you want to see what I mean, just click here: http://www.youtube.com/watch?v=_JBHPFiFWRk and watch them for yourself. The song is most enjoyable when you’re watching the twelve dwarves at work! I wish that I could have jumped through the screen and joined in the party! I would have, too, if it were possible. Oh, I said I had three songs. The next one is here: http://www.youtube.com/watch?v=NRUBe2RTq74. This one is called “Misty Mountains” and is more of a chant than a song. It certainly is not dancing music, like “Blunt the Knives.” Instead it’s very slow and contemplative. I wish I could have listened to it without seeing the movie, then I could have focused on the music alone. Although, if I had, it may have put me to sleep the same way it did to Bilbo (in the book)! Despite that, watching the dwarves chant does add something to the tone of the song. Seeing the longing in their faces makes the viewer understand how much they miss their home under the mountain. Yes, there’s gold there, and jewels, and Smaug killed a lot of dwarves when he took over the kingdom, etc. … But he did more than that, as their expressions show. He took away the place that they knew was theirs, the place that belonged to them; he took away their home. As Bilbo points out later, he has his hobbit hole. More than that, he has the Shire. He’s not accustomed to sleeping in hard places with no fire and warm food. He’s not used to running from trolls and orcs. 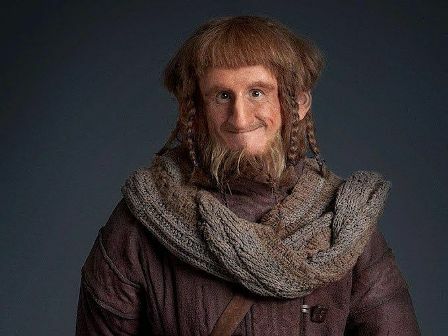 The dwarves are used to these things because for years they haven’t had a place that is safe, like the Shire is; they haven’t always been able to have the comforts of warm food and a fire. The chant is the only tie they have left to remind them of what that kind of life is like. So the song shows, in a way, that the gold and jewels and revenge are secondary. What they want most out of this venture is their home back, not the gold Smaug hoards. Yes, we all take home for granted, just like Bilbo. Right, now for the third song. This one plays at the end of the movie, when the credits roll. If you want to hear it, go here: http://www.youtube.com/watch?v=QA9XlO2TmjI. These lyrics, unlike the lyrics for the other two, were not written by J.R.R. Tolkien (the author of the book The Hobbit, or There and Back Again, which all three Hobbit movies are based on). This song was written and performed by Neil Finn. It shares a few verses with “Misty Mountains” but Finn does the rest. 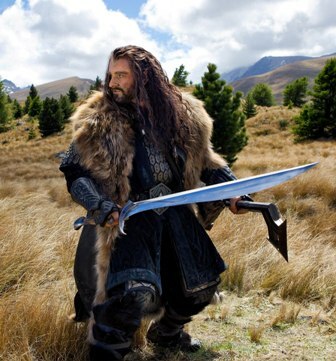 The dwarf king, Thorin Oakenshield, is shown at a forge early on in the movie. While at work, he is brooding over the loss of the Lonely Mountain kingdom his grandfather ruled. This song seems to be based on that scene, with the music emphasizing that Thorin (if not most of the dwarves) will never forget what Smaug stole from his people, nor will he forgive him. It carries the methodical pounding of a hammer on hot iron; the beating of the drums of war. Thorin and his followers, the song explains in a sort of roundabout way, are coming back for their kingdom if it kills them. They’re going to kick Smaug out of the Lonely Mountain or die trying. I know, I know. I do sound like a film promoter. So does that mean you’re not interested? Anyway, these are the places where you can find the music without going to the theater. Morgan can watch the clips with you, too. In fact, I would recommend that you show her “Blunt the Knives.” I think that she would like it. Got to go. Write you – well, whenever! 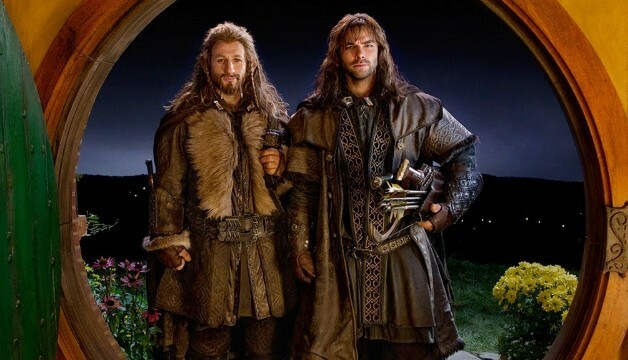 This entry was posted in Music Reviews and tagged Bilbo Baggins, Dwarves, Music Reviews, Songs from the first Hobbit film, The Hobbit: An Unexpected Journey, Thorin Oakenshield on April 22, 2013 by The Mithril Guardian.